Here's an awesome witch from Queen Kat named Rianda the Witch. I am using some fun brads with tags "BOO" and a cute Under a Spell sentiment to go with her. I have colored her up in beautiful green and added a wonderful bat border to the top of this card. This adorable paper is from Blackbird line of My Mind's Eye. It matches perfectly with the brads. Be sure and check out all of Terri Nickleson's wonderful stamps and all the fun Halloween theme images at Queen Kat. 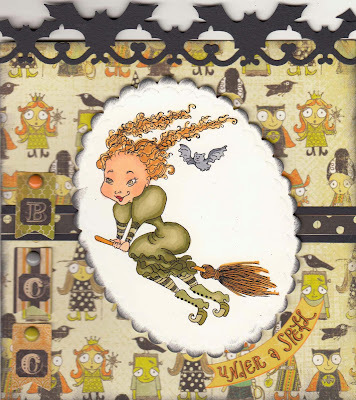 I just love this gorgeous witch, be it for a Halloween card or just for fun anytime! Love this cute witch and great colour theme. Great background paper. Awesome image, and the card is too cute!